We have reason to suspect two ties this week – or, perhaps, a three-way tie. Will tonight be the first? It’s a tight one, even if the scores are a bit underwhelming. Now let’s see what each player should do. Bill should wager 8,600 to cover Jenica. Jenica can wager up to 7,600 to stay above Bill if they’re both wrong; Michael, up to 3,200. Jenica should wager 800 to cover Michael. Michael should wager at least 3,600 and will need to get it right if Jenica makes this smaller wager. That would put him out of contention against Bill, so he’ll want to go all-in if he chooses this route. Jenica should wager at least 1,000 to cover a zero wager by Bill, and at least 2,000 to cover an “unsafe” wager by Bill. 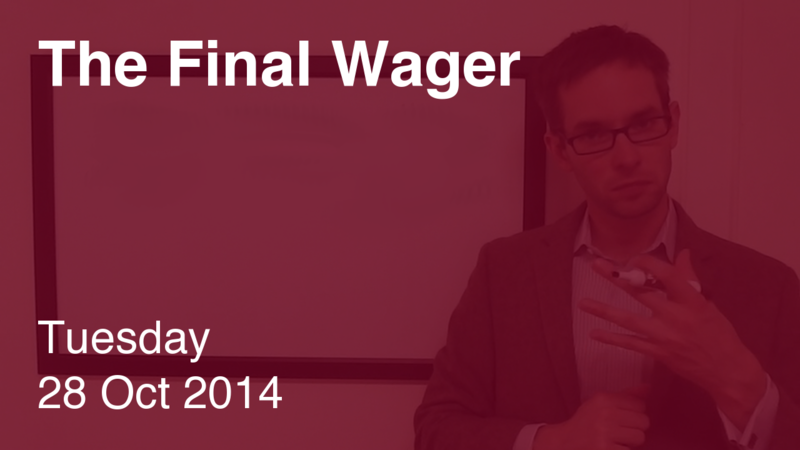 Jenica should further cap her wager at 4,400 so as not to lose to a zero wager by Michael. Yep, so that happened. Will they repeat the feat tomorrow? Who are The Woman (Eve) and The Serpent (Satan)? Thanks for your analysis, Keith! I completely goofed on the Final Jeopardy thinking they were referring to Adam and Eve fighting over the apple, but they independently spoke with God about it. I love that you do this for every episode. It’s great. Thanks for coming by, Michael! It was a tough clue – I know a few smart people who thought Cain & Abel were the subjects in question! Hope you’ll stick around, particularly for this upcoming TOC. Another possibility for Jenica is capping her wager at 1,200 making it impossible for Michael to win if he goes for the 3,200 or less range (that would cover a zero but not an unsafe wager from Bill). Good point, Kelly! Not the easiest scenario… but I think the new system I’ve developed will deal with this very nicely.